Email Marketing, Campaign Goals and Measuring the ROI! If you're going to do email marketing then, to achieve satisfactory results, you must do it properly. This series of articles should have illuminated that high-quality email marketing is not easy. It takes time and effort to get your contact database organized, it takes technology and the ability to use it, it takes creative talent for preparing content and, it requires the ability to set email marketing campaign goals, measure performance against those goals, and to calculate the return on investment. Let's not forget the headline that email marketing is one of the most cost-effective forms of marketing, capable of generating 4,000% returns (or $40 for every $1 spent). However, if you've read my previous blogs in this series then, while I've acknowledged it may be possible to earn these kinds of returns, you must be operating among the elite of email marketers to do so. 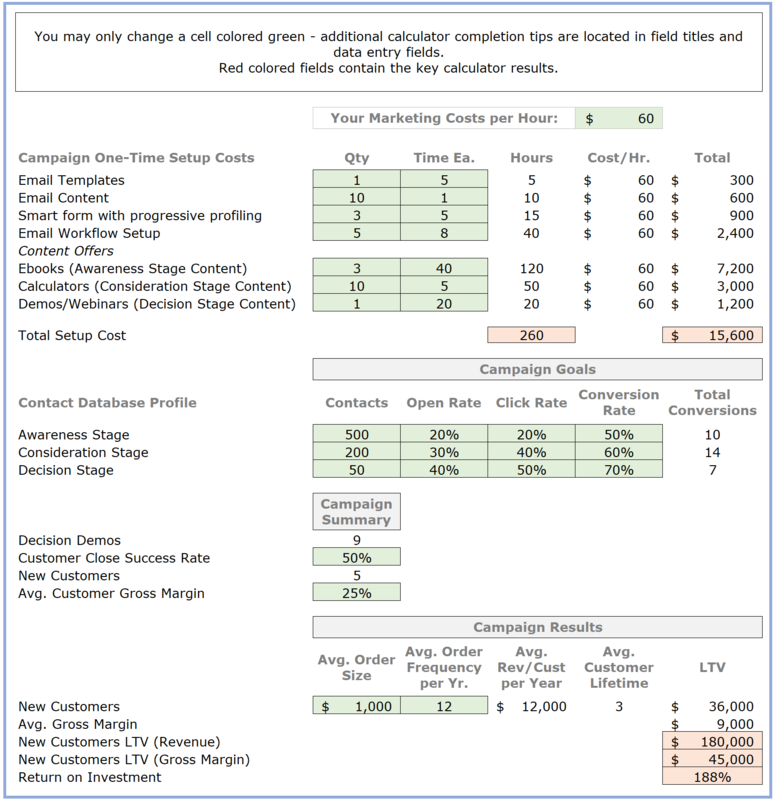 I've evaluated numerous online calculators and, while they may display compelling ROI's of up to 4,000%, most don't take into account that the ROI should be calculated off margin (or better still profit) dollars rather than revenue dollars (which most do) and, nor do they really help a marketer understand all the steps required to achieve the ROI results they indicate. The example I've included below details over $15,000 of one-time setup costs. These costs consist of time, in fact 260 hours, with each hour invested valued at $60. Remember, your contact database contains leads that are at different places in the three buyer lifecycle stages of awareness, consideration and decision. It should be logical for you to expect you'll get different levels of engagement from the contacts who are at different stages in the lifecycle, with higher engagement rates at the consideration and decision stages, than at the awareness stage. Based on this example and the assumptions I've used, the goal of this campaign would be to achieve nine (9) demos to prospective customers. Using these assumptions we know the lifetime (revenue) value of a new customer is $36,000 and the lifetime (margin) value is $9,000. With five (5) new customers projected, the return on investment (using gross margin, not revenue, as the determinant) is calculated at 188% - not too shabby, but still a long way from 4,000%! There are numerous variables affecting the ROI. Obviously the gross margin percent, the average order size and frequency, along with the lifetime value of the customer are key but, so also are the number of contacts and where they are placed in terms of the lifecycle stages. Experienced marketers, with an engaged contact database, will most likely have higher proportions of the contacts in the consideration and decision stages which, in turn, will be likely to lead to higher ROI outcomes. However, even experienced marketers launching new products must take their contacts through the beginning (awareness) stage before they can expect to achieve the higher conversion rates associated with the consideration and awareness stages. So, whether you are an email marketer starting out, or a veteran of numerous campaigns, it will be necessary to be moving contacts through each of the three stages at all times. Learn how the aftermarket industry has failed the independent office products resellers and compromised the future for office supplies dealerships. Its own failure to understand the digital revolution, and the impact that's now having on the industry, small business and sales channel development. Our free e-book casts a critical look on the industry shortcomings.